I switched from BA back to development last year and was looking for good books to learn from, and one of my friends suggested HFDP. I didn’t know much at all about design patterns – I’d only really encountered MVC. This is a book to work through rather than a reference book. It presents a series of design patterns with exercises including code ‘fridge magnets’, crosswords and general challenges. The code samples are all in Java, but very simple and should be no problem for non-Java devs – there is a very positive review from an ActionScript developer on Amazon! The patterns it covers are: Abstract Factory, Adapter, Command, Composite, Decorator, Facade, Factory Method, Iterator, Model-View-Controller, Observer, Proxy, Singleton, State, Strategy, Template Method. In the appendix, it also covers: Bridge, Builder, Chain of Responsiblity, Flyweight, Interpreter, Mediator, Memento, Prototype, Visitor. Although I did read the whole book in the end, I didn’t follow the exercises – partly because I was using an e-reader, and partly because I just didn’t want to spend that much time on it. By the time I finished, I felt that I had got what I wanted out of it, which was a high level understanding of the patterns, and the ability to better recognise where I was using them and have a conversation about them. The book is really easy to read and follow, and mostly quite fun to read, which is its main strength, and this also shows in the reviews on Amazon. Each pattern is introduced using a story of somebody asking for a software solution. Often the authors use conversations between a fictional team of developers trying to solve the problem to explain the concepts. There are lots of diagrams and “Q&A”, reviews of what you should have learned, and a nice summary at the end of each chapter, which was good to refer back to. 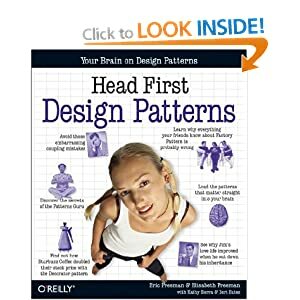 The book also explains and emphasizes OO principles, and how they are linked to each pattern, which I liked. The extra summaries in the appendix of the patterns that didn’t quite make it into the main text were also really useful. My main gripe with the book is that the stories and code samples are too far removed from real life situations, which made it more difficult to grasp some of the patterns first time around. The second time I read it, I had a lot more context and could relate what I was reading to real-world code I’d seen on projects. The puzzles and exercises don’t lend themselves well to reading on an e-reader. I also grew slightly tired of the ‘Fireside Chats’ between design patterns, and after reading about two thirds of the book I began to wish they would hurry up a bit more.